Something new is happening to gin… Well, we say “new”. In fact, it’s something old. Many distillers are experimenting with barrel-aged gins to put an interesting twist on their drinks. To quote a famous Monty Python line, what have the Romans ever given us? Well, aside from sanitation, law and order, etc., they probably helped begin the process of barrel-ageing alcohol. While the process is familiar to fans of whisky/whiskey, the process clearly had to begin somewhere (and, perhaps, be gin somewhere?) but where and how? As with so many things in the food and drink industries, it appears to be a happy accident. According to some theories, the Romans – and the Gauls – noticed that the wine stored in wooden containers tasted better than the wine that had been stored in clay vessels. 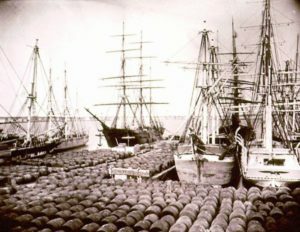 Wood gradually became a more common material for such storage and by the time that boats – and sailors – had progressed to more transoceanic voyages, more and more barrels were being used for storage. Initially, it was practicality: wood was sturdy, cheap and its antibacterial qualities may have also been noticed. Beyond that, however, people noticed that alcohol stored in wooden casks had mellowed by the time it reached its destination, becoming less harsh and also picking up notes – depending on the wood – of spice, vanilla, nuts and other flavours. By the time of the nineteenth century, when gin was transported in oak barrels, many of the barrels used were being recycled, having previously contained other drinks, such as sherry. As a result, gin aged in such casks developed a reputation for flavour and smoothness – a process that’s gaining a new popularity in the gin market today, as a way of enhancing the spirit’s colour and flavour, while remaining true to the key botanicals. As well as the historical happy accident, the inspiration undoubtedly came from the whisk(e)y industry who have been using wooden barrels to flavour, colour and finish their spirits for years, be it fresh oak, “toasted” oak – charred to varying degrees to bring out the wood’s natural sugars and oils, which infuse in the spirit – or barrels that have housed assorted other drinks. Dalmore’s King Alexander III, for example, is a mix of aged malt whiskies matured in six different casks: Oloroso sherry, Cabernet Sauvignon wine, port, Marsala, Madeira and bourbon. Spirit Works Distiller owner/distiller Timo Marshall samples whiskey that has been listening to Prince and Michael Jackson. whole new sub-genre of gins and other spirits. 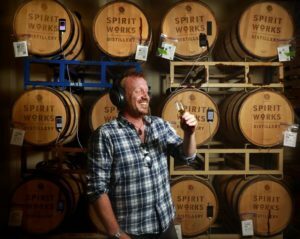 Spirit works Distillery in Sebastapol, California, for example, have pushed this to new extremes, offering a barrel-aged gin, a barrel aged slow gin and getting very creative with their whiskey: they’ve placed headphones on some of their barrels and have been playing music to them, 24/7! Each barrel is “listening” to a different genre, and it’s not as crazy as it sounds: the vibrations from the music affect that barrel/liquid interplay. Early reports suggest that the classical barrel is showing very little difference to their usual whiskey, but the drum n bass barrel is darker and more intensely flavoured. At Fifty Pounds, our own foray into barrel ageing isn’t quite as eccentric, instead echoing back to the process’s more historic roots and that sense of “happy accident”. 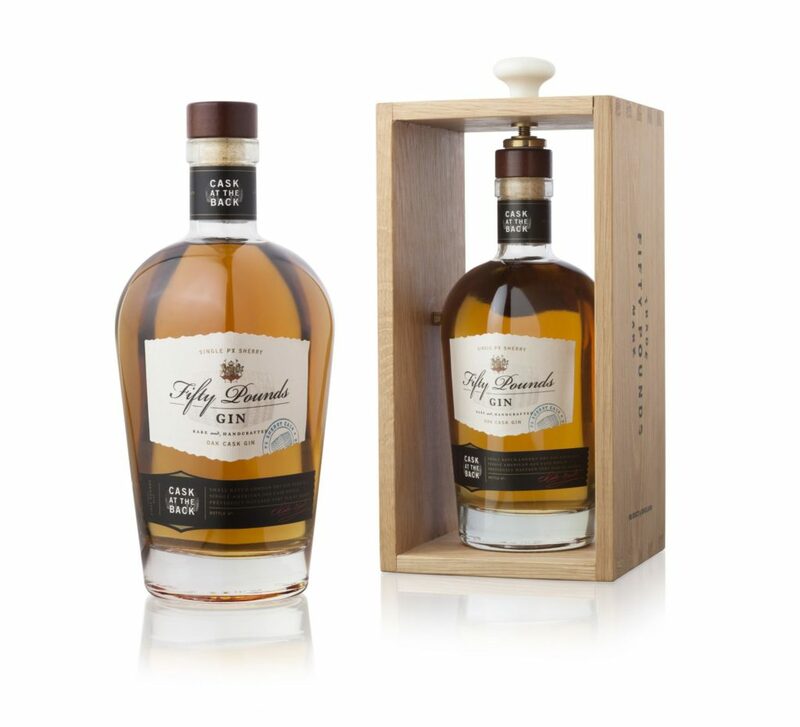 Fifty Pounds barrel-aged gin is called “Cask at the Back”, which refers to those barrels which were stored at the back of the warehouse, and were usually there for longer than those at the front since access was more difficult. The extra time makes all the difference… As does the choice of wood, of course. Despite this glorious hue, the Fifty Pounds signature juniper and citrus notes shine through on the nose, however, they sit alongside hints of wood, toasted oak and, as you’d expect from the PX influence, raisins, prunes and nuts. On the palate, it’s a similar combination: initial sweetness giving way to smoothness and a long, rounded, smooth finish. Cask At The Back is a limited edition bottling with only 500 bottles available worldwide. The gin has been aged for 7 years in a single barrel and is a satisfying nod to what makes Fifty Pounds – Fifty Pounds, a tribute to the joys of Pedro Ximenez and, in its unique nature, a unrepeatable and delicious history lesson.